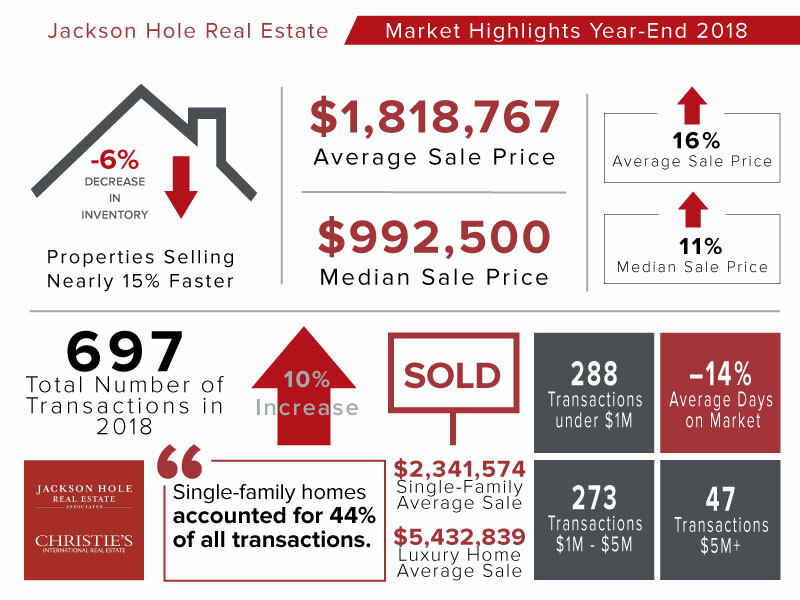 Jackson Hole Real Estate Associates is pleased to present the Jackson Hole Real Estate Market Report for Year-End 2018. Drawn from our proprietary, forty-year old database (not just MLS data) and supplemented by our team’s exhaustive knowledge of the area, the Market Report provides the most comprehensive insight into the local real estate market. The Jackson Hole real estate market ended the year predictably strong. The appeal of the valley’s rugged beauty and active lifestyle continues to be reflected in the local market, with 2018 seeing 10 percent more transactions and a 35 percent increase in dollar volume over the prior year. Average and median sales prices were also up 16 percent and 11 percent, respectively. Several notable sales drove these figures, including the historic Snow King Hotel, a legacy ranch property southeast of town, and a ranch and equestrian property on Spring Gulch Road. Properties under $500,000 have become even more difficult to find, evidenced by a 24 percent decrease in sales. That category made up only 12 percent of the year’s transactions. Most sales took place in the $500,000 – $1 million segment, which accounted for 36 percent of sales. Single-family homes made up about 44 percent of all transactions this year, a 20 percent increase over 2017. Overall, inventory dropped about 6 percent and properties are selling nearly 15 percent faster compared to the previous year. At Jackson Hole Real Estate Associates, we closely follow trends it the region’s real estate markets to provide the most up-to-date, relevant and actionable insight. If we can provide more information about your area, please don’t hesitate to contact our dedicated team of professionals. Whether you are looking for a home or property, or simply want to learn more about the area’s real estate markets, we welcome the chance to lend our expertise. Click here for an electronic copy of the Market Report, or contact us for more information.